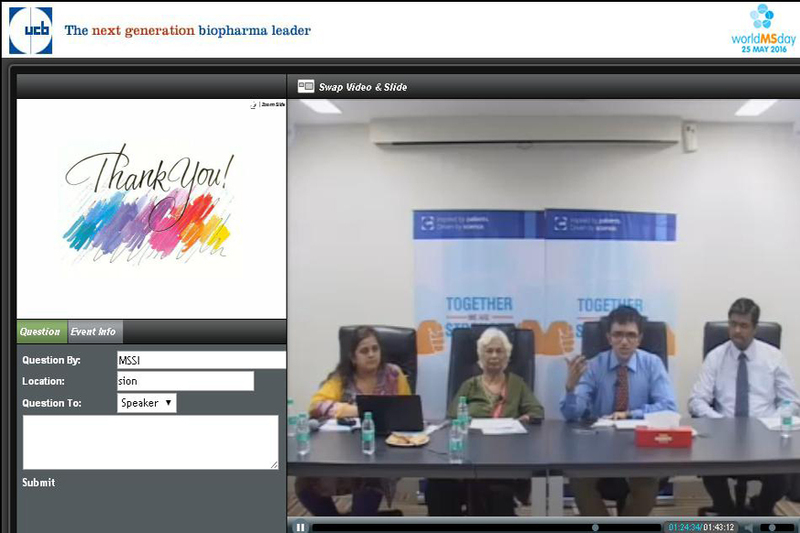 UCB had organized a Webcast on Saturday 28′ May 2016 on Living Well with M S This was a good opportunity for patients and their care givers to listen and interact with the Speakers from the comfort of their homes. 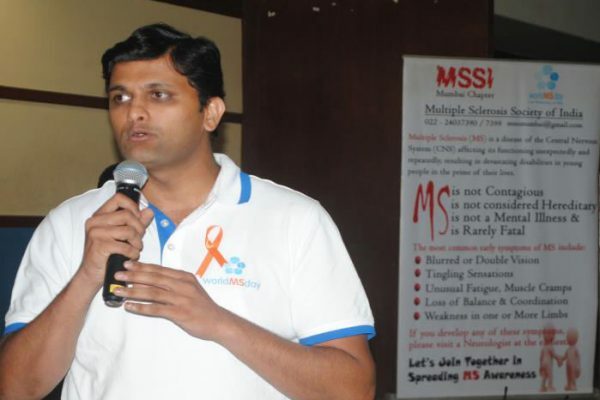 Pavan Kumar, Patient Services Manager, UCB India, welcomed all & gave brief information about World MS Day & MSSI’s Month of creating maximum awareness. Dr. Girish Nair, Neurologist from Fortis Hospital explained on Importance of Adherence. He explained in detail how the decease modifying therapies help MSP if it is started at the incept of the MS & how the continuation of the same with your Neurologist’s advice can improve the quality of life for a longer period. Dr Satish Khadilkar, Sr. Neurologist. Bombay Hospital in his recorded message spoke about now there are number of therapies available & hence there is a hope for managing MS symptoms better. 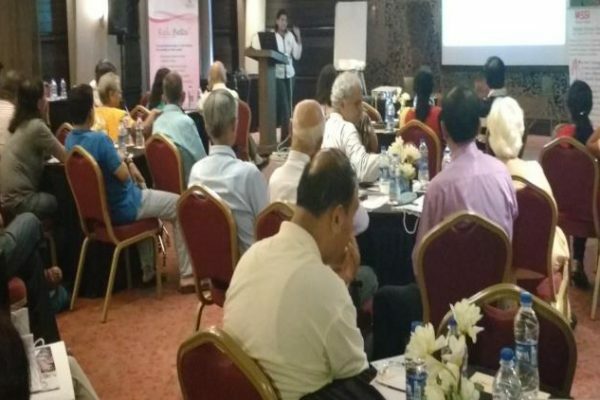 Ms. Sheela Chitnis, Chairperson of MSSI, Mumbai, explained the role of MSSI as a support system in India for MSPs & also for their families and also informed about the regular welfare schemes undertaken by all the Chapters in India for improving & maintaining the quality of life of MSPs. MSP Tina Tejas, spoke that in spite of her MS , she has maintained her balance of home chores & her office work. She is an inspirational example to all MS families. 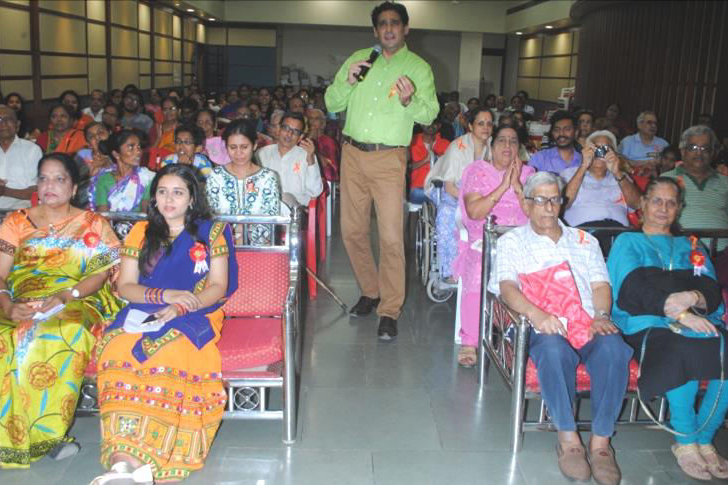 MSSI Mumbai Chapter on Wednesday 25th May 2016 celebrated World MS Day with lot of MSPs & their families. We had organized a Musical Evening at SIES Auditorium, Matunga from 4.00 p.m. to 7.00 p.m. 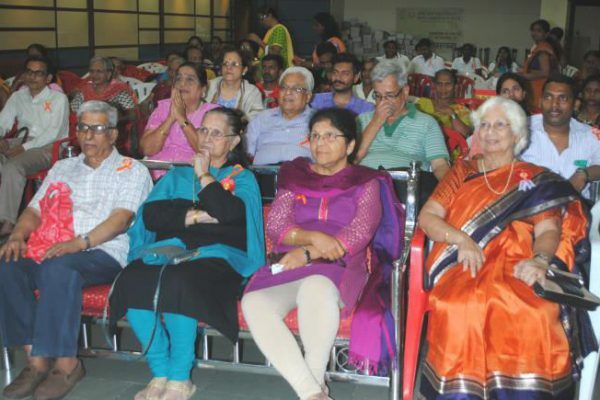 The Chief Guest of the program was BJP Corporator Rajshri Shirwadkar , from Sion , Matunga area. In her speech she applauded the services of MSSI provided to the MS patients and encouraged young MSPs to overcome their difficulties and live an independent life. Dr. Rahul Joshi, Homeopath & Popular Music Therapist & Singer enthralled the audience for 2 hours in his melodious voice with Karaoke. He highlighted on different Ragas for different chakras of our bodies to improve quality of life. His selection of popular Bollywood songs took the audience on a musical journey where they enthusiastically participated in singing along with him. This year’s World MS Day’s, Global theme was Independence in MS. Hence we decided to give Mobility aids to those who have some financial constraints and they are deprived of the benefit of using Mobility aids. 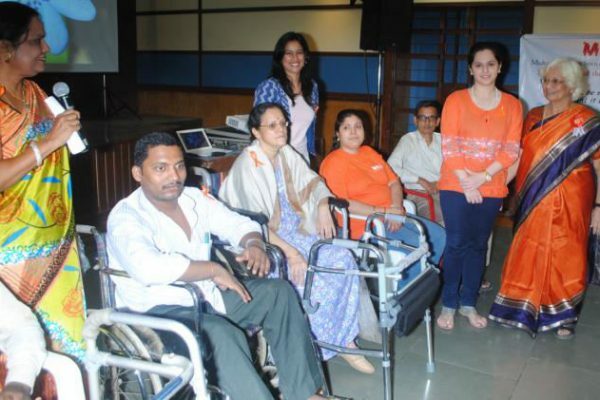 MSSI purchased user friendly Wheelchairs and Bajaj Electricals Ltd donated Walkers & Tripods. 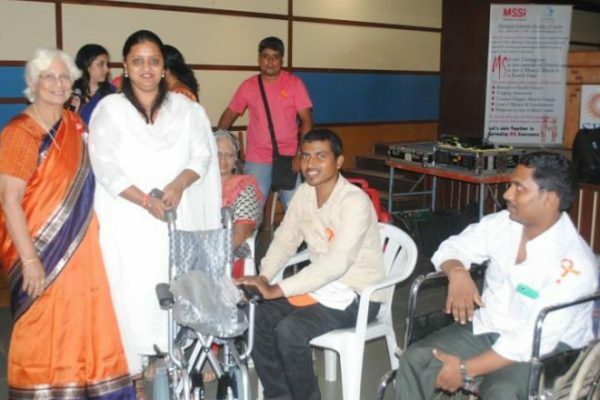 On behalf of MSSI, Chief Guest Mrs. Rajshri Shirwadkar distributed these mobility aids to MSPs. MSSI acknowledged by presenting Plaques to: Nobel Hygiene for regularly donating Adult Diapers & Bajaj Electricals Ltd for donating Walkers & Tripods for MS Day. Our sincere thanks to : Chief Guest, BJP Corporator Rajshri Shirwadkar for being present in spite of her busy schedule. Our Special Thanks to : Dr. Rahul Joshi for conducting a Relaxing & Refreshing Musical Evening at the concessional rate. We thank Dhara Thakkar for Comparing the Program & donating Fruit drinks. We also thank MS families, well-wishers, donors & all present. MSSI provided sumptuous snack boxes to all. Conveyance was paid to needy patients. As orange was the color for WMSD we distributed orange bows to everyone & T-shirts to some. Cyber City Magarpatta has a huge community of young software professionals working with most prominent corporate names so it was an ideal venue for Awareness. 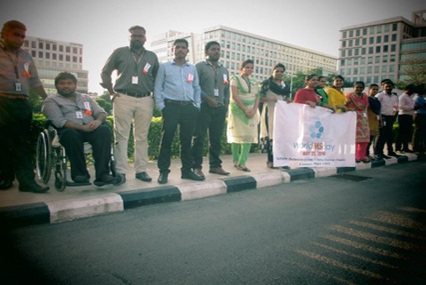 MSSI along with their Community Partners BNY Mellon group of volunteers organised an Awareness Drive at the Amphitheatre, Aditi Garden on 25th May 2016 between 5 pm and 6 pm when their streets and by lanes have maximum people outdoors. Hon Secretary Mrs Sunita Lalwani welcomed all. MSSI orange caps drew good crowds who took time to listen to the Presentation made by Mrs Lalwani and gathered a lot of knowledge about MS, its impact and challenges faced by MS persons and also learnt that MSSI was active in managing and facilitating many issues with these persons. BNY Mellon volunteers had made big charts which attracted the onlookers who had lot of queries which Chairman Mr JP Banerjee and Mrs Sarita Varma clarified and impressed upon them the importance of being aware of health issues which are less known like MS.
A leading hospital in Chennai “Fortis Malar Hospital” hosted a Medical Camp in their premises. MS persons were seen by the Dentist, the Gynecologist, the Urologist , the Ophthalmologist, the Neurologist, the Diabetologist, and other blood tests, etc were taken. The camp lasted for over 4 hours. The patients were able to get a thorough check up. On the morning of May 24, 2016, a prominent and Senior Neurologist Rd. M.R. Sivakumar, Mrs. Ann Gonsalvez, Chairperson, MSSI, Chennai and two MS persons, Mrs. Vasanthi Parameshwar and Mr. Sivakumar, gathered at Chennai Live Radio Station and a live question and answer session was conducted for 30 minutes. Audiences are large for this Radio Station and phone calls poured in after the talk. 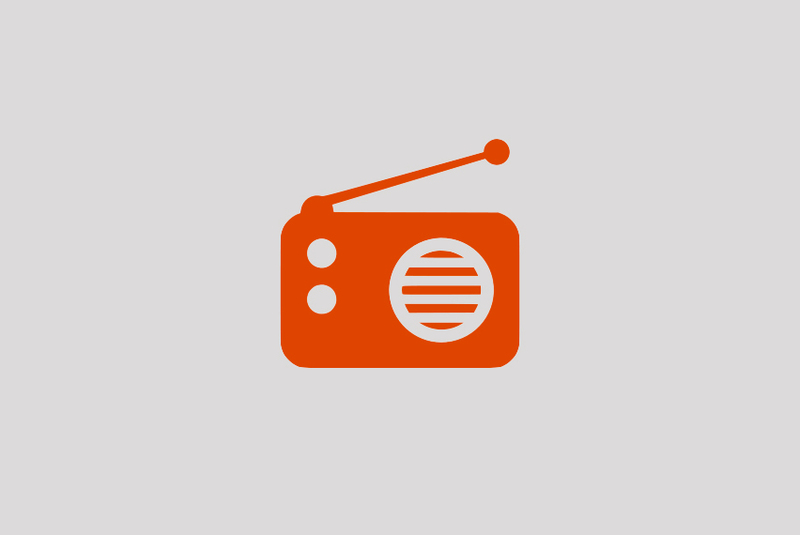 Radio Rainbow – Government sponsored Radio Station . A “Talk Show” was held at a prominent Hotel in the city on May 24, 2016. Six MS persons – Mr. Gopi, a Research Scholar, Ms. Bharathikannamma , a young, B.E. 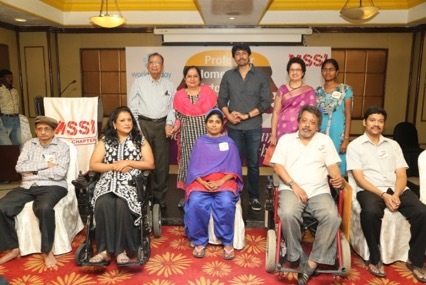 Electronics Engineer, Prof. Sunder, a Professor of Mathematics, Ms. Smitha, a Social Activists, Ms. Pramila , Leadership Trainer & Executive Coach, and Mr. Shanmuganathan , a retired engineer, father and grandfather all spoke of each of them “Being Stronger than MS”. Each talk echoed the pathos the all went thru’ braving MS, and still climbing the ladder in their professional and personal lives. A top comedy actor “Mr. Karthik Kumar” hosted the show. They were about 100 guests , well wishers, donors, MS persons and carers. 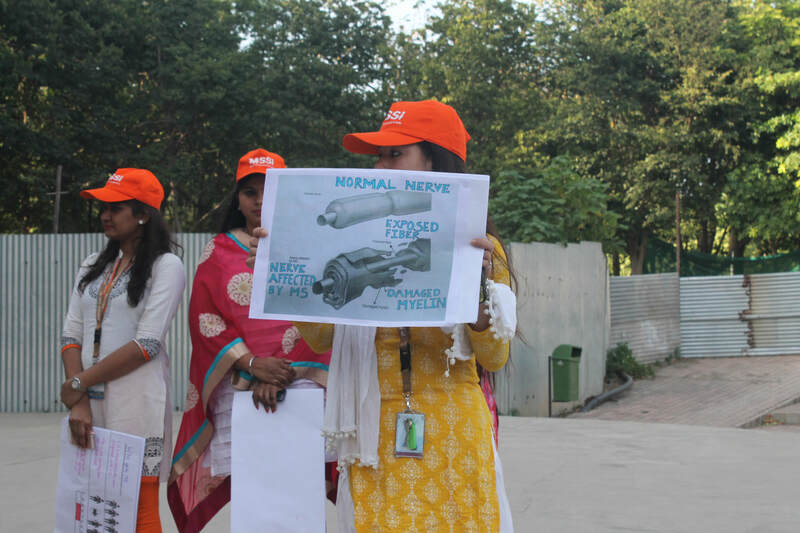 It was very well received by one and all and created the much needed “Awareness of MS”. The meeting was followed by sumptuous dinner. 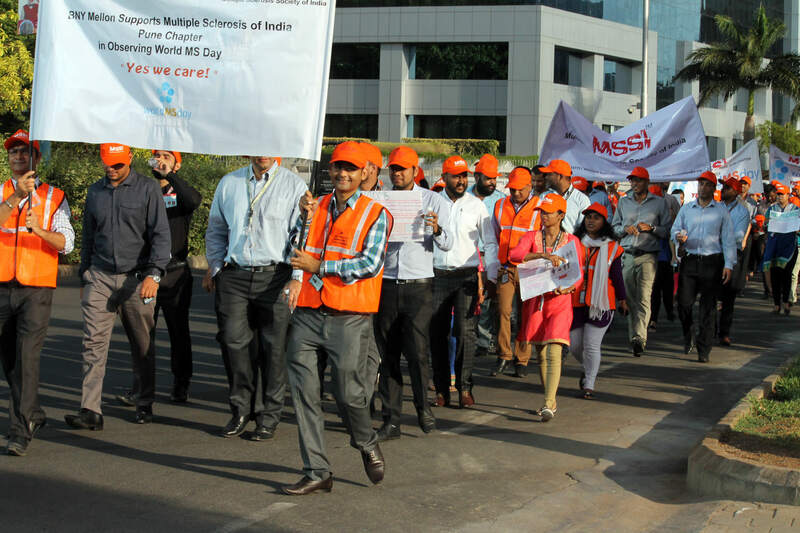 Multiple Sclerosis Society of India along with global MS Societies observes World MS Day on the last Wednesday of May every year. 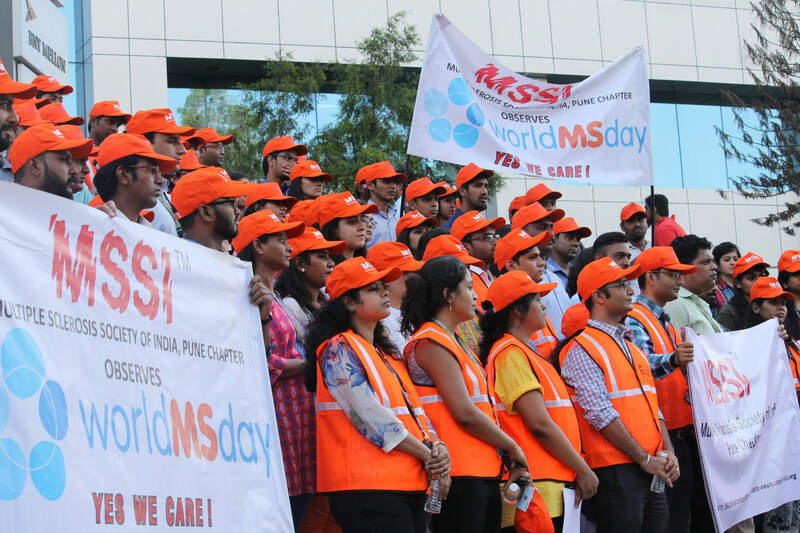 This year MSSI had decided to organize various nationwide MS awareness campaigns throughout May. 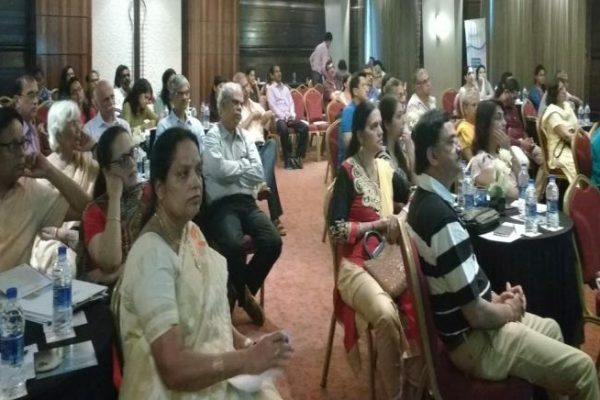 On Sunday 22nd, in association with Kokilaben Dhirubhai Ambani Hospital, MSSI Mumbai Chapter had organized an Educational Medical Seminar, on “ Multiple Sclerosis, New Developments” at Grand Sarovar Banqet Hall , Goregoan from 10 .30 am to 1 pm. In all 110 people were present including many Doctors, Patients, Caregivers, Therapists and MSSI Team . Dr. Mohit Bhatt, Neurologist & Director Neurosciences, KDAH. Welcomed all present. 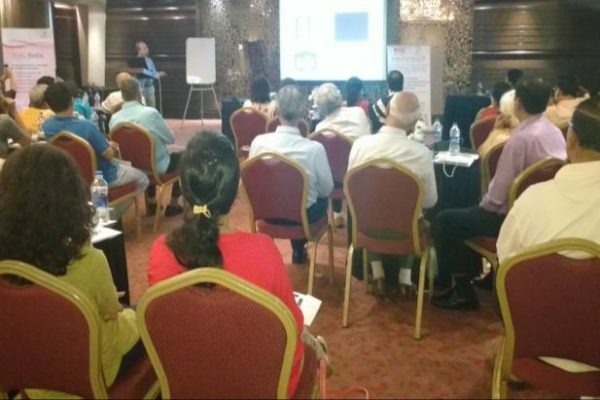 Following Doctors from KDAH enlightened the audience by sharing their expertise on various aspects of MS.
Dr. Chinmay Mehta, Neuroradiologist, Multiple sclerosis mimics : MRI to the rescue. 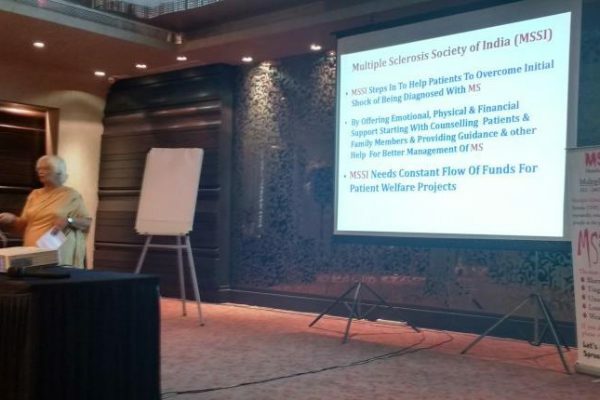 On behalf of MSSI, Sheela Chitnis spoke on 31 Years Journey of MSSI , where she highlighted the ongoing patient welfare Projects & Rehabilitation. She also highlighted various Awareness drives taken by MSSI, Mumbai . This was followed by animated Question-Answer Session where all these experts participated. 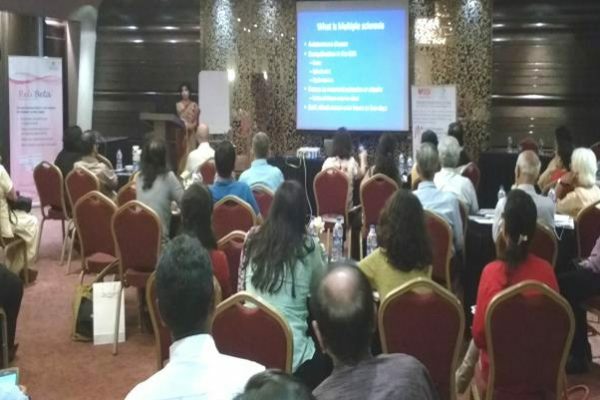 MSSI is grateful to Kokilaben Dhirubhai Ambani Hospital, our special thanks to Dr. Mohit Bhatt & Dr. Annu Aggarwal for organizing an excellent Medical Seminar & providing lunch to all present. 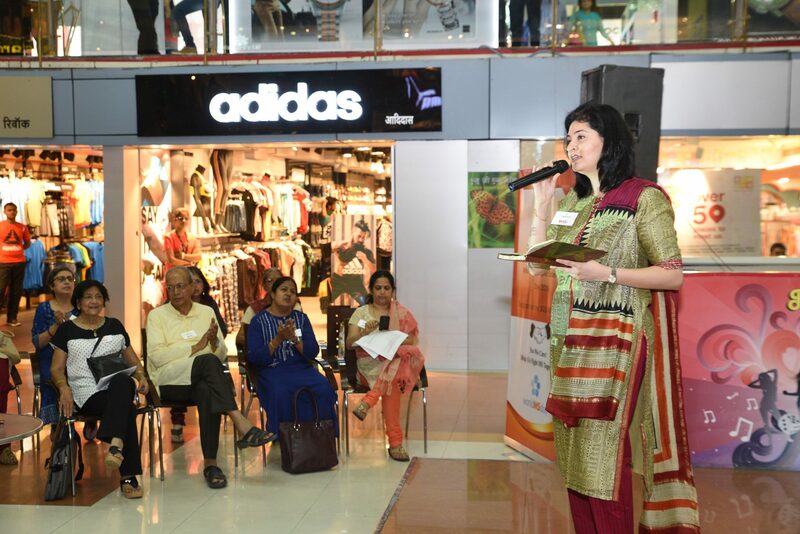 We offer our sincere thanks to all KDAH doctors for giving us valuable information on MS.
WORLD MS DAY 2016 was observed on 14th May 2016 at SGS MALL, Moledena Road, Camp area. Saturday’s leisure crowds at the Mall, plus the audience made it a decent gathering and we were happy with the interest generated at a public place. Chairman Mr JP Banerjee welcomed all listeners to the WORLD MS DAY 2016. He talked about MS & MSSI. 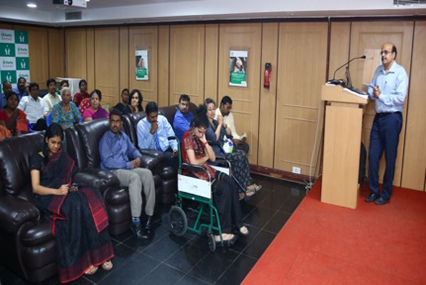 Mrs Sunita Lalwani presented a PPT to explain about MS and the challenges faced by MS persons. This year WMSD theme being “INDEPENDENCE”, two of our MS persons Mrs Jyoti Ronghe and Mr. Amit Bhandari had prepared audio visuals about what independence meant to them and this was played to the audience. The AVs were very informative and appreciated by the public. Later singer Madhura Gogate entertained all with some motivational songs in her melodious voice and the audience too chorused along. Mrs Asha Merchant made many join in for the 1-minute games she organised. Mr JP Banerjee felicitated MSPs, Caregivers, Volunteers and Donors as a token of appreciation for their involvement in improving the lives of MSPs. 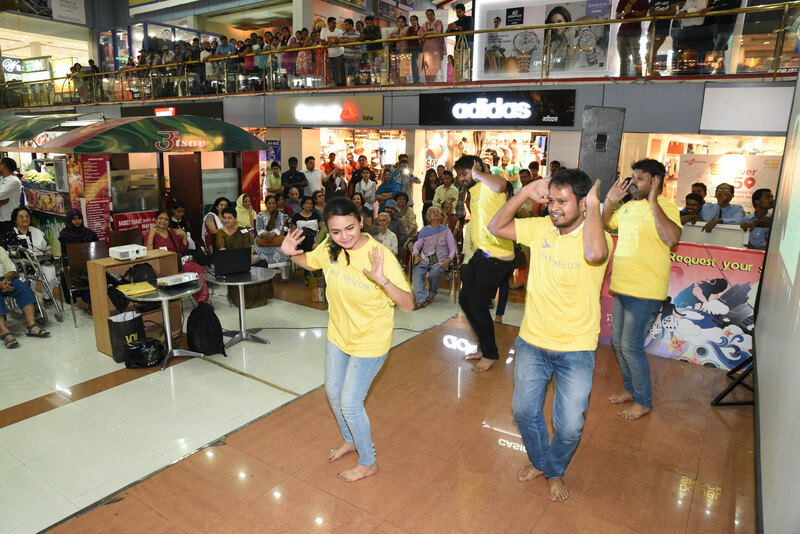 Our Community Partners BNY Mellon group of volunteers cheered the crowd with a dance along with a popular Marathi song and even obliged the crowd with an encore performance.